This issue begins with a flashback to Mars where we see the Green and White Martians at war with one another. We see J'onn J'onzz fighting the White Martians, and briefly see his family. John reveals that he has never been a violent man and didn't want to fight. He also reveals that he is the last of the Green Martians to survive, as his family and race has all died. He tells Batman that Jor-El of Krypton found him after this was and give him a purpose again as they hunted criminals from around the galaxy and placed them in the Phantom Zone. He also tells Bruce that he was sent here to be Clark's protector; that is until he became Superman and fulfilled his destiny. Back in the Batcave, Alfred gets a call from Bruce asking how Barbara is doing. Alfred lets him know that she is doing fine and Bruce is given some relief. Bruce tells John that Barbara is his anchor, the one person who can remind him not to lose sight of his goal. Shortly after, by using their detective skills, the two discover that the first murder by the White Martian happened at a cabin in the Rocky Mountains, which is conveniently close to Checkmate's base, the Castle. When Batman and Martian Manhunter arrive, they find it still in ruins from when General Zod destroyed it back in the Season 9 episode "Sacrifice". In passing, J'onn mentions that when the public finds out that Clark is an alien, that he will face the challenge as he always has. Batman then throws his Echobats into the Castle and they build a map based off of their scans. The two jump in and start to search for the Martian. Three miles later, they find a launch pad with a rocket inside. But that's not all they find as John stumbles on a dead man's body and Batman upon a child's doll. Batman deduces that when Zod brought the Castle down, that it trapped the man in the launch bay with no way to get out. They find the man's phone and play a message. In the message, they find out that the man is Doctor King Faraday and in his final moments he begs whoever is watching to take care of his daughter. The first has got to be the origin of Martian Manhunter. Back when J'onn first appeared in Season 6 of Smallville in the episode "Static" (believe it or not, I didn't even have to look that up), I immediately fell in love with the character. This was around the time that Justice League Unlimited was ending and the Smallville episode "Justice" was going to air soon. And not only that, but Martian Manhunter had just been revamped in the comics and was given his own series for the first time since the mid-1990s. 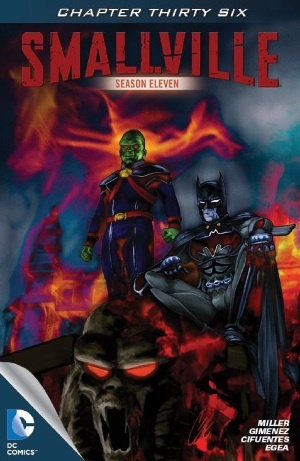 Because I grew up with the Justice League animated series and even The Batman (which featured J'onn as a recurring character in Seasons 4 and 5), I have grown very fond of the character of J'onn J'onzz. His origin here struck me, because it's portrayed a little different here than it is normally. Normally, the Martians fight each other with their powers and science fiction type weapons, but here they fight with primitive weapons. I was a little shocked by this, but it was cool. Final thing about J'onn's origin, I really liked how they tied it back to J'onn and Jor-El teaming up to imprison the "Zoners" that we see in Season 6. That was great for continuity and I really enjoyed that. Oh, and by the way, the Zoner that we see Jor-El and J'onn imprisoning is Aldar from J'onn's first appearance in "Static". Again, good continuity. On that note of good continuity, I liked that the place where the White Martian originated from was the Checkmate Castle in Colorado. I loved all the references to when Zod took the place down in "Sacrifice," and the panel flashing back to it was cool as well. I'm still wondering why the government just left the ruins of the Castle there though. I mean, as we saw in "Detective," anyone with a brain could march in there and find Checkmate's intel! And we see that again here when J'onn and Bruce go in. I do like the irony of one alien (Zod) destroying the base and freeing another alien (the White Martian), especially since Amanda Waller (who has GOT to be alive and working on the Crisis...) was so paranoid when it came to aliens. Also, just a quick mention, those Echobats that Bruce used here were sweet. Unfortunately, the only thing I could think of while looking at them though was those things in Prometheus that do the same thing. If you don't know what I'm talking about, don't worry about it. Prometheus was a stupid movie in my opinion anyway. But moving on from that, I also liked that BQM put King Faraday in "Effigy" because he is a character with close ties to both Martian Manhunter AND Checkmate. He was a main character in the "The New Frontier" story in the DC comics (which is what the animated movie "Justice League: The New Frontier" was based off of) and was a good friend to J'onn and he was also Amanda Waller's "White Knight" when he was a part of Checkmate. I was kind of sad that he was dead and that we aren't going to see him again in the Smallville Universe, but I am happy that he was in it at all. I'm interested to hear more about this "daughter". I'm thinking that this "daughter" is the White Martian. How that's possible I have no idea, but it would make sense based off of the last panel. On that note though, I would say that "Effigy" may be a fancy way for BQM to bring M'gann M'orzz aka Megan Morse aka Miss Martian to the Smallville Universe. If the White Martian is in fact Faraday's "daughter" and if John does in fact take care of her, how could she not be Miss Martian? That is my theory. Maybe I've been watching too much Young Justice or maybe I'm just thinking out of the box, but I really believe that this is the case. But I guess we'll find out for sure next week when I'm back after "Effigy" concludes! Art - 5: There's not much to say about the art other than I really like it. Axel did Batman, Martian Manhunter, Jor-El, Aldar, and the White Martian really well and that final panel of the White Martian was breathtaking. I really enjoy the art for "Effigy".